If you’ve read around this site, you’ll already know that I’m a huge advocate of the benefits of a hydroponics system. Quite simply: it’s impossible to achieve far better growth rates than is possible by using traditional growing techniques alone. Before I first dipped my toes into hydroponics, I was overwhelmed by the different systems I was able to choose from — there are literally hundreds of them! However, almost every type of hydroponic system is built around the principles of one of these six systems (or perhaps a hybrid between two systems). Understanding the basics of each type will allow you to make an educated decision when selecting your first system. If you don’t have the time (or simply aren’t interested!) to learn the science behind the different systems then you probably won’t get much from this article. I’d recommend you click here to see the best hydroponics systems on the market today for your specific needs. The most commonly used hydroponics system is the drip system. The main principles behind the hydroponic drip system are relative simple which makes them incredibly easy to use, hence their popularity. Vital nutrients are added to a tank of water to create a nutrient reservoir which is kept separate from the plants. The water is then pumped up a network of tubes, and is released to the plants individually. The pump can be controlled by a timer, taking any manual watering out of the equation, and allowing you to decide how frequently you want a watering cycle to occur. You can also place an emitter at the end of each tube in the network to allow more, or less, water to reach a specific plant during each watering cycle. This means that you can put a range of different plants into the same system and tailor make watering cycle to cater to the different plants’ individual needs. There are two types of drip systems: the recovery drip system and the non-recovery drip system. The recovery part of the name is pretty self-explanatory, and refers to whether the water recycles itself or not. In a hydroponic recovery drip system, any excess nutrient solution will drain back into the nutrient reservoir, where it can be re-used. This makes the system much more efficient; consequently, a relatively low amount of maintenance is needed. You will have to check the solution reservoir periodically: as the plants absorb the nutrients this will start to distort the makeup of the nutrients remaining in the water. The ebb and flow hydroponic system (otherwise known as a flood and drain system) is also a very popular form of hydroponics. They work in a similar way to the drip system, but are actually even more simplistic to use which makes them a great first hydroponics system for an amateur gardener. 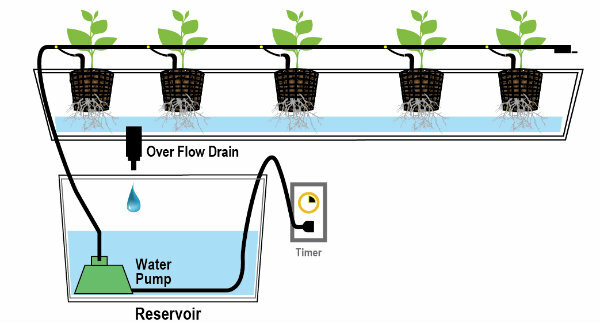 Like in the drip system, an ebb and flow system also makes use of a nutrient reservoir, keeping the water in a separate tank to the plants, which are placed in a growtray above. A timer is set to periodically activate a pump which is kept in the nutrient reservoir. When activated, the pump will flood the growtray with the nutrient solution, feeding your plants the nutrients they require for optimal growth. 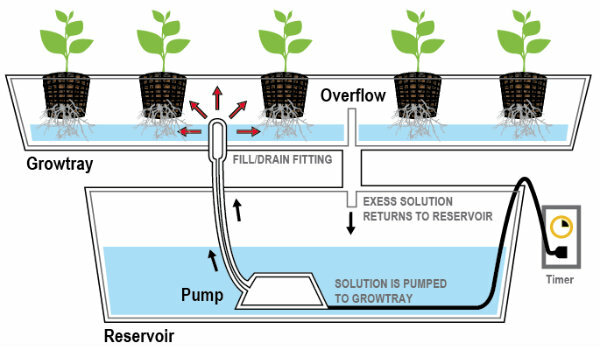 When the growtray is sufficiently flooded, the system will turn itself off, and the excess runoff will begin to drain back into the nutrient reservoir. This continuous cycle of flooding the growing tray, and then allowing it to drain, is where the system gets its name. Because the runoff filters back into the nutrient reservoir the system is very low maintenance, and almost self sufficient. As with the drip system, the pump timer can be manually set to feed your plants as frequently as necessary to suit their needs. However, unlike the drip system, there is no way to tailor the amount of the nutrient solution that each individual plant receives: all plants in the growth tray will be flooded equally. Because of the ebb and flow systems simplicity, it is relatively easy to build your own system at home. However, if you don’t have the time for this you can also pick them up relatively inexpensively, and the simplicity of the system means most are plug in and go. If you’re looking for the perfect hydroponic system to start with, I recommend one of these as they are almost impossible to do wrong! The third type of hydroponic system is known as the Nutrient Film Technique, or NFT for short. NFTs are often used in commercial hydroponics, particularly for short harvest crops. Unlike the first two systems we’ve looked at, an NFT system does not require a timer. Instead, the nutrient solution is pumped from the reservoir up into the growtray in a continuous cycle. The growing chamber is built with the slightest downhill decline, allowing the solution to trickle from the top end of the tray to the bottom, where it is recycled back into the nutrient reservoir. Instead of a regulated watering schedule, the plants in an NFT hydroponic system are provided with a constant flow of nutrient solution. The slope is set at a shallow angle to ensure the solution only trickles along the growing tray. However the slope is sufficient for ensuring that the solution does reach the bottom, where it is drained back into the reservoir. This ensures the growtray is never flooded, which prevents your plants from being overfed. In fact, only a small film of nutrient solution is accessible to the plants — which are suspended above with their roots hanging down — at any given point. Because there is no timer involved there is less scope for anything to go wrong. This means maintenance is kept to the bare minimum: You simply prepare the nutrient solution and then turn the pump on. Because the system can run for so long without being manually checked, they usually include an air stone in the nutrient reservoir which is vital for keeping the water within the system oxygenated. The aeroponic system is the most technologically advanced of all the hydroponic systems. Many top scientists have claimed that this very system could be the solution to food shortages in the future. The plants are suspended in the air, as in the NFT system, with their roots hanging down below. The nutrient solution is then pumped up a tube, where a second higher pressure pump sprays the solution as a mist over the dangling roots. Because each misting provides the plants with less food than a standard cycle in, say, a drip system, the misting takes place considerably more frequently, which does mean a more advanced timer is required. This, as well as the high pressured pump, can mean that the component costs are higher for this type of system. The nutrient water is moved around far more frequently in this system due to the regularity of the feedings, as well as the actual process of turning the water into mist. This means the nutrient solution is far more oxygenated than in any other system, and this helps the plants achieve faster growth rates. The plants will also adjust to their feeding methods, and will grow more roots to enable them to absorb more nutrients from the mist. The reason this technology is considered essential for future food production is that it offers the possibility of a group of plants to be grown vertically, meaning less land is required to farm. If a plant can be suspended on a vertical wall, with their roots protruding out the other side, then the roots can be misted using the techniques already described. Deep Water Culture (DWC) systems are by far the most simple method of hydroponics. They are often used in classrooms to provide a working example of a hydroponics system, so you yourself may have already seen one of these systems in action! Unlike the other systems we have looked at, the growtray in a DWC system is not kept separate from the nutrient reservoir. Instead, the growing platform (often a piece of Styrofoam) is simply floated on top of the nutrient solution! This floating platform will hold the top of the plant, including the leaves, above the water, but will have holes cut into the bottom to allow the roots to grow down and directly into the solution. Because the nutrient solution in this type of system is not circulated, it is essential to include an air stone to keep the water oxygenated. It is also not an appropriate hydroponic system for every type of plant: Because the roots are constantly submerged in an abundance of nutrient solution, many plants will suffer from being overfed. Therefore it is recommended you only use this system for water-loving plants, such as lettuce. If you have an old aquarium lying around the house and have access to a plank of Styrofoam then you could put together a simple DWC hydroponic system in minutes! If you are interested in building your own DWC system, click here for my complete guide. Yes, an aquaponic system actually features real, living fish! Far from being a novelty hydroponic system though, this arrangement actually creates an intricate ecosystem that benefits both the plants and the aquatic life swimming below! In an aquaponic system, the fish are essentially living in the nutrient reservoir. Their excrement releases ammonia into the water, as does any uneaten food. Ammonia is toxic to fish, and if they remain in water filled with ammonia they will die; therefore, it must be removed to keep them healthy. The good news for the plants in the aquaponics system is that the fish are effectively creating a natural fertilizer for them. When bacteria mixes with the ammonia in the water it will turn into nitrate, one of the nutrients that is essential for optimal plant growth. This is then pumped into the growtray where it is fed to the plants. As the plants absorb the nutrients they remove the toxins from the water. The runoff, now free from ammonia, is then drained straight bank into the nutrient reservoir, where the fish live. Clever right? The fish benefit the plants by providing them with a naturally produced fertilizer. The plants benefit the fish by removing toxins from the water, leaving it fresh and clean when it is returned to the tank. As I said at the start, a complex ecosystem, but one that is extremely effective. It is also a lot more fun to look at, and a devious way to get your children interested in hydroponics! So there you have it, our extensive guide to the six main types of hydroponics systems. Hopefully you’ve now got a better idea of which type of hydroponics is right for you. If you want help picking out the best system, click here and we’ll show you the best systems on the market today.